At the present time the development of the abdominal muscles has become almost a fad with some physical culturists. If you pick up a magazine devoted to exercises you are almost sure to find some pictures showing young men with their bodies bent forward so as to make the muscles in the front of the abdomen stand out in ridges. Since the muscles along the front of the abdomen are fastened at top to the breast-bone, and at the bottom to the bones of the pelvis, it follows that contraction of these muscles bends the body forward and brings the chest closer to the knees. I can see the importance of these abdominal muscles, but I think that no man would cultivate them and leave his back-muscles neglected. 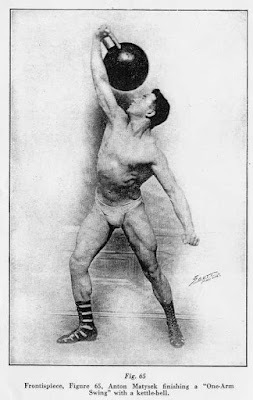 Eugene Sandow, who "started" so many other things, is responsible for the craze for abdominal development. The muscles on the front of his abdomen were phenomenal; but not a bit more phenomenal than the muscles on his back. Up to the time that he made his debut as a vaudeville performer, it was customary for a professional "Strong Man" to work in a high-necked jersey; and as these men never stripped or did muscle-poses in a lighted cabinet, the people who saw their acts never got a chance to see the remarkable development of the abdominal muscles which many of them possessed. In a real "Strong Man" the muscles on the front of the abdomen should be plainly visible when the body is held erect. It should not be necessary to bend the body over, as in Fig. 34, in order to make these muscles noticeable. If you look at the picture of Sandow in Fig. 35, you can trace the outline of the abdominal muscles; even though in this pose, he is actually leaning slightly backwards. In his case, these muscles were so noticeable that out of a hundred people who saw him pose, ninety-nine would remember the development of his abdominal muscles, where only one would notice the wonderful cables of muscle along either side of his spine. As a rule, I can say that most men and boys who take up body-building exercise end up by having a better development on the front of their bodies than on the back of their bodies. This is due to their constant habit of standing in front of a mirror and studying their own development. It is easy for them to see the outline of the muscles on the chest, those on the front of the abdomen and the muscles on the front of the thighs. They see the width of the calves of the legs, and if it seems insufficient, they will do exercises to make the calves wider, forgetting that the important thing is to make the calves deep from front to back. Similarly, they will work hard to make the thighs look wider and never once think of the vitally important muscles on the back of the thigh, which they never see in the mirror. Worst of all, they do far more exercises for the muscles on the breast and on the front of the abdomen, than for the muscles on the back of the body. I am not trying to discourage the developing of the abdominal muscles, but to make you realize their place and proportion in your whole muscular get-up. The next step in abdominal development is to sit on a bench or a chair and then lean back and pick up a light bar-bell, rest it on the upper-chest, and bring the body back to a sitting position. Naturally, the feet have to fastened to the floor, and the customary thing is to either put the toes under a strap or else to put the insteps under a heavy bar-bell. This variation should not be attempted until it is easy to use 50 lbs. in the preceding method, and then you should start on the chair with 10 or 15 lbs. When you can make several repetitions with 50 lbs., it is time for you to graduate into Roman-chair or Roman-column work. Now we are coming to really advanced abdominal exercises. In all the previous variations, where you rest the body, your weight has been supported at the hips and all the bending has been done from the hip-joint. In the Roman-chair and Roman-column work, the support is at the knees, which makes it much more difficult; because, for one thing, the leverage is longer, and for another thing, the work is shared between the abdominal muscles and the muscles of the hips and thighs. Of the two kinds of apparatus, the column is much preferable. If you refer to Fig. 37, you will see that there are rests for the feet, and that most of the athlete's weight is carried by the chains fastened at one end of the post, and at the other end to straps buckled around the upper part of the calves. In a properly arranged Roman-column, when the athlete leans back and throws his weight against the chains, the knee-joint should be but little higher than the ankle-joint. The first exercise in the Roman-column is to learn to get in the sitting position shown in Fig. 38, which, but the way, is much harder than you would think. Then you learn to bend backwards and lower the body until the finger-tips touch the floor, as in Fig. 39. The real work comes in raising the body again to the sitting position, and no one should even attempt the stunt unless the muscles of the abdomen and the groin have been developed and strengthened by the preceding exercises. Since, on your first attempt to use a column, you might find it impossible to bring your body up, you should always have a friend present to rescue you, if necessary, from the head-downward position. During the first week's practise you will gain in strength at a surprising rate; and while the first day you may not be able to bring your body up even once, on the seventh day you will do it many times with the utmost ease. Then is time to start with a light bar-bell; ten or fifteen pounds is enough to begin with. You have to lift it from the floor, hold it against the bend of the hips, and then bring it with you to the sitting position. You can make the work harder either by increasing the weight of the bell or by holding it close to the chin instead of in front of the hips. The further the weight is away from the knees, the more strength it takes to raise the bell and the body. After a month's practise you will suddenly awake to the fact that you have a degree of bodily strength which is entirely new and most pleasing; and you will wonder why it was that you wasted so many weary months trying to get real strength by performing the kindergarten exercises which started this chapter. Since few Roman-columns are available, many athletes have to resort to the use of the Roman-chair, which is illustrated in Fig. 40. Such chairs have to be of very strong construction. The straps on the seat of the chair hold the athlete's feet firmly in place, and the top of the chair is padded. The back and seat should be inclined as in Fig. 40, and not upright and horizontal as in the ordinary chair. My objection to the chair is that you have to bend the body back farther in order to reach the ground. In the pictures of the Roman-column, you will see that when the body is down it is at right angles to the calves of the legs; and in the pictures of the Roman-chair, the body has to be bent beyond the right angle. Undoubtedly the idea of the Roman-column occurred to some gymnast or athlete who was familiar with the parallel-bars. It is possible to do Roman-column work on a pair of parallels, providing the bars are not too far apart. All you have to do is to sit sideways, with the insteps under one bar and the bend of your knees over the other bar. Since most parallel-bars are adjustable, both in height and in width, you can fix them so that your legs will stretch across the open space between the bars, and so that when you are hanging head-downwards, your finger-tips just sweep the floor. It is easier to do the work on a Roman-column, because the leg-straps and the foot-rests are padded; but if you can't find a Roman-column or a chair, there is nothing to prevent you trying the column exercises on a pair of parallels. I'm afraid that some of you will be discouraged when you read this chapter, and that you will decide to give up all idea of getting to be super-strong if it is necessary to do stunts like this. A man who has only average strength is hardly able to imagine what it feels like to be really strong. Let me assure you that a man who has gotten super-strength by practising with weights thinks no more of getting on a Roman-column and doing an exercise three or four times with a 50-lb. bar-bell than you would think of lying flat on the back and raising your legs in the air three or four times in succession. I realize that if you have never tried it, Roman-column work seems at first glance to be a most difficult and dangerous form of exercise; just as the performance of the Kreisler or a Heifetz seems highly difficult and complicated to the man who has never taken a lesson in violin playing. You probably have thought that it would take the strength of a Hercules to do Roman-column work. That is more or less true; but the point is that if you can learn to do it, you will get the strength of a Hercules; and once you have the strength and the corresponding muscular development, you will surprised at how easily you can retain it, and how little work is necessary to keep the body at the highest pitch of condition. Make up your mind to this: If you ever get to be super-strong, you will thereafter have no patience with the "light" exercises which formerly seemed to be all-sufficient. If you can get on a Roman-column and repeat the exercise a few times in the course of one minute, why should you spend a half-hour lying on the floor and raising first the legs and then the body to the perpendicular position? When you get so that you can handle 600 or 800 lbs. in a hand-and-thigh lift, and that five minutes' practice per week keeps your back and leg muscles in fine shape, you will have neither the time nor inclination to bend over and touch your toes 200 or 300 times in succession. So far as I am aware, there are no records for Roman-column work, because it is not a competitive lift, but is used either as an exhibition stunt or as a developing exercise. When using it as an exercise, you should never push yourself to the limit of your strength, but should always keep a factor of reserve. It is not necessary to repeat the exercise every day, two or three times a week being sufficient to keep the muscles growing in size and strength. Fig. 40 is a sample of the bodily strength which can be created in this method. Few ordinary athletes can hold the body horizontally when the feet are strapped to a Roman-chair. This man can hold his own weight, plus the weight of a 100-lb. man at arms' length. If the other man were resting across the lifter's thighs, the stunt would be easy. In this instance it is hard, because the extra weight is right above the lifter's chest.